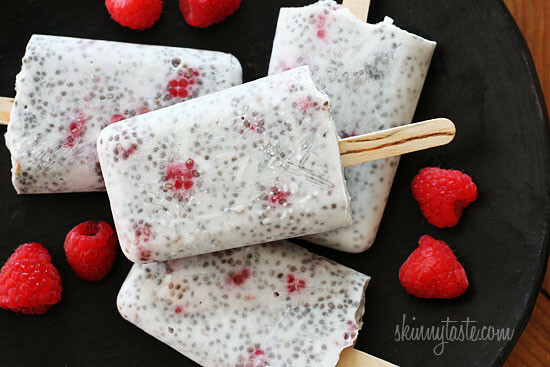 Raspberry coconut chia pudding, in a popsicle! These easy chia pudding pops are perfect as a healthy snack or dessert, even breakfast on a hot summer morning! I absolutely love chia pudding. Some of my other favorites which can easily be turned into pops are Superfood Triple Berry Chia Pudding, Coconut Lime Raspberry Chia Pudding, and Mango Coconut Chia Pudding. Quite frankly, when I thought up this idea I didn’t know what to expect. I recently saw a recipe for rice pudding pops which sparked this idea. I LOVE chia pudding and I love coconut milk, so I figured how bad could they be so I basically recreated my mango coconut chia pudding using raspberries in place of the mango. The texture, the flavor and the little bits of fruit in each bite. They are refreshing and delicious and virtually guilt free! Don’t be scared, give them a try! I used Nu-Natural liquid stevia (my favorite stevia) but you can use whatever sweetener you prefer, and sweeten it to your taste. And by the way, if you are new to chia… chia (yes, same chia as a chia pet) is an ancient grain eaten by the Mayans and Incas. It has a lengthy list of essential fatty acids that support heart health, plus fiber which helps support normal functioning of the digestive tract. It also keeps you full for longer periods of time, so it’s great to add to cereal, muffins, etc. If you can’t find them in your health food store or Trader Joe’s you can buy them on amazon. Combine all ingredients in a large container. 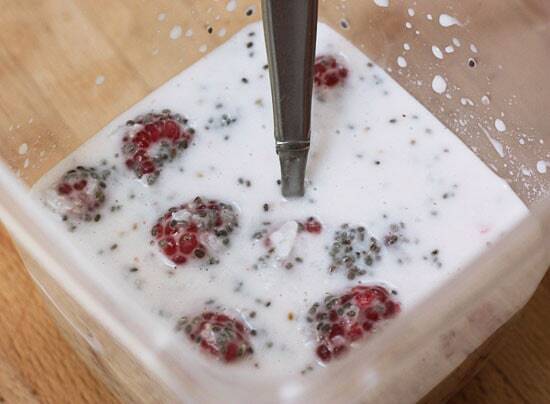 Mix well and close container; refrigerate 4 hours so the chia expands. Pour into 4 popsicle molds and freeze overnight. I made these and loved them before I froze them! When they were in popsicle form they lost most of their taste… Any remedies for this? I am allergic to nuts. I have tried making chia pudding with just coconut milk and it does not expand. do you have any suggestions? Not sure, my chia starts expanding in minutes when it hits water. We are corn intolerant so can't use fortified nut milks. Could unfortified skim milk be used? Sure, any milk would work. I didnt have a Popsicle mold so i used the nest best thing… an ICE TRAY!! Worked perfect plus they are great bite size snacks. I am allergic to nuts would this recipe be doable with Vanilla Soy milk instead of almond milk? I have made this recipe many times with raspberries and/or strawberries and the delicious pudding never makes it to the freezer!!! Lol! Gina, these look yummy. I have a couple of questions for you (and anyone else that wants to chime in) … A few months ago, I unintentionally thawed a bag of frozen blueberries by leaving the bag on the counter for a couple hours after grocery shopping. So, I poured them in a glass container & put them in the freezer. They froze into a solid brick. UGH! I thawed them in the fridge because I need to use them … alllllll two cups of them! Yes, blueberry crisp or pie would be ideal; but, i don't like them since blueberries have such an overwhelming-strong taste in pies alone. (1) Please share your ideas for how to use up two cups of blueberries. (2) I'd love to make these popsicles using blueberries instead of raspberries … but, is it safe to refreeze fruit after it's been thawed twice? Thanks in advance for any suggestions you might have! These look MARVELOUS! i CAN'T WAIT TO TRY THEM! I recently posted a PEach And Chia popsicle recipe on my blog and the blog i write for BabyGizmo linked to your pudding recipe. Not sure you saw it and maybe I inspired you. Guess great minds think alike. Love your site. Just ate some of this as just a pudding and it is amazing!!! My 7 year old and 1 year old ate it right up! Yummy! Love Chia Seeds and Coconut Milk! These were awesome!! I have been cooking from your website every night for the past month and my 4 year old is loving it (and so am I)!! are there any substitutes for coconut milk if you don't like the taste of coconut? Love the idea of chia in pops! Is the chia…taste wise…like the chia tea taste at Starbucks. Wow! These look so much easier than I ever would have imagined. And pretty, too! I use granular Truvia. Since you use another liquid sweetener how much Truvia should I use for the pops? Add it to your taste. I would put a little at a time until you are happy with the sweetness. Your Popsicles look fantastic!! 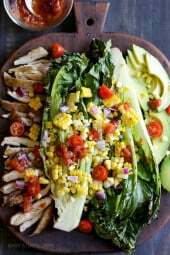 I love the flavors, heck I love everything about this recipe! I must make them this weekend!! Yummy, 3 of my favorite ingredients combined in a popsicle! I really need to purchase popsicle molds and make those beauties. Thanks for sharing. I was wondering about grinding the chia, too. I thought you don't really get the benefits of seeds like that unless you grind them up (like flaxseed)? Or does that only apply to flaxseed? That's only flaxseed. One of the pros of the chia is that you don't need to grind them. Your body is capable of digesting whole seeds. I cannot wait to try these!!! All of your recipes that I have tried always turn out fabulous, and I can't wait to try chia seeds in something new! can I use ground chia? I don't think it expands when ground. Whole is bet. Can't wait to try this. Every morning I make your Healthy Pumpkin Oatmeal Shake with almond milk and add in either flax or chia seeds. Thank you for all your awesome receipes!!! Also, to the person asking about Almond Breeze Almond/Coconut milk. I often make a shake using the same ingredients above but with frozen bananas instead of rasberries and the only milk I use in it is Almond Breeze Almond/Coconut milk so I am sure it would work. I have a Zoku, but so far I have only used it once. This recipe has inspired me to use it again, and I will report back on how the pops turn out. Looks yummy! These look awesome!! I loved the chia seed pudding! Does anyone have any thoughts on the Zoku versus the regular popsicle molds? I love my Zoku and have gifted it to many friends. They also enjoy it. I like not having to wait long for the pops to freeze. 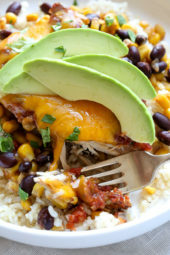 OMG i was gasped when the site loaded and saw this recipe!!! Hope that was a good gasp! Lol yes it was. 😉 it was a '''gasp'''' I am so making these! I tried your mango coconut chia pudding this week, and I LOVE IT! Can't wait to give these pudding pops a try too – chia might be my new best friend. You just gave me a new way to enjoy chia! Chia seeds can be ordered on-line at amazon or found at your local health food store. They are relativly inexpensive. The Vitamin Shoppe also carries them. If you cant have almond milk could you use more coconut milk? I added a link to amazon above so you can purchase it if it's not available near you. OMG, these look fantastic! I can't wait to make them. Am I crazy thinking that a little bit of cocoa powder would work in these as well? Mmmmmmmm! I buy Nutvia chia seeds from Amazon Grocery becuase they are hard to find in my area, and super expensive when I do. Where in the grocery store can I find chia seeds? Not sure if my other comment went through or not, but I think these look really good! What mold do you use? 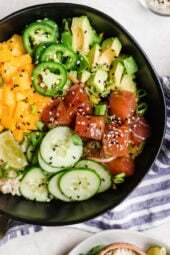 What is Chia and where can I find it? It explains this pretty clearly in the article above the recipe. "chia (yes, same chia as a chia pet) is an ancient grain eaten by the Mayans and Incas. It has a lengthy list of essential fatty acids that support heart health, plus fiber which helps support normal functioning of the digestive tract. It also keeps you full for longer periods of time, so it's great to add to cereal, muffins, etc. If you can't find them in your health food store or Trader Joe's you can buy them on amazon." You can also get them at Whole Foods in the Bulk Section (and Wegmans!). I love them! They seriously make you feel FULL. Like…REALLY, really full. For a long time. Hmmm…maybe I'LL try it today! What a great idea! 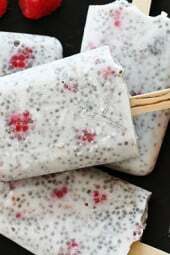 I love chia pudding and this is perfect summer snack, thank you. What popsicle molds do you use? I've had difficulty finding one I like. Thanks! This was one of those kiddie ones that has a straw, I just leave the bottoms off and use my own sticks. Do you use canned coconut milk? These look delicious and I can't wait to try them with my boys! I never thought of tempering almond milk with coconut milk since almond milk on its own doesn't freeze very well. Brilliant!